Today marks the official union between Continental and United. Rather than attempt to wax eloquent about what this means for us and express more reservations that "things will never be the same," I want to raise my glass and salute the new airline today, and talk about why there is room for optimism. I first stepped on a United Airlines plane (a 757 bound for Denver from LAX) in the winter of 1995 and have never looked back. I think about how I have grown up with United and witnessed the rise and fall and resurgence of one of America’s most storied air carriers, and unequivocally say that through thick or thin, United has earned my business and my praise. Deep down, I don’t think that mindset will change with Continental now onboard. Did you know that United and Continental share a common founder, William Varney? United Airlines first operated under the name Varney Airlines delivering air mail. On April 26, 1926 Varney inaugurated the first fixed route, fixed schedule service between Boise and Pasco, Washington, ushering in the birth of the modern aviation age. In 1927, William Boeing bought Varney Airlines (among other airlines) and changed the company name to United Aircraft and Transport Corporation, which was renamed United Air Lines the following year. Continental Airlines, also founded by Varney, was born in 1934 under the name Varney Speed Lines and transported passengers and airmail. Its name was changed to Continental Air Lines in 1937. So the carriers that trace their heritage back to a common founder have now united. Last week on a Philadelphia to Chicago flight I smiled when I heard the purser use the following welcome message, hearkening back to the 1980s, "Ladies and gentleman, welcome aboard our Friendship Service to Chicago." After landing at O’Hare, she thanked us for "flying the Friendly Skies of United." Such slogans, long abandoned at United, may seem sappy to some, but they reminded me of better days at United and demonstrated an optimism that the "glory days" are not merely a relic of the past, forever consigned to the dustbin of history. Continental and United are currently very different airlines with very different employee and corporate cultures. Each airlines brings a lot to the table and United now has the opportunity to fashion itself into one of the world’s leading airlines not merely in terms of miles flown (it has achieved that honor already), but in terms of service and quality. With the right mix of leadership and investment (and a recovering economy), this aspiration is not merely a pipedream. 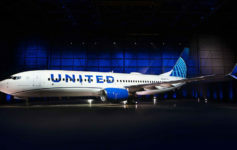 Here’s a look at the first aircraft, a 737-900, outfitted in United’s new livery. Today it will make its maiden flight from Houston to Chicago, transporting CO big wigs to their new home in the Windy City. We are on the cusp of a new era. There are worries that persist, but today I celebrate and express optimism that the new United will be a better airline for all of us. The flight attendant on my flight MSP-DEN on Saturday also said “Thank you for flying the friendly skies.” Was probably the best service I’ve had on a UA flight in years. Too bad the flight was so short! Maybe the friendly skies are coming back…. It would also appease the people angry that with CO’s livery winning out, UA has lost (will lose) much of its identity. Some of United’s email addresses have changed with the merger to unitedco.com . My notification that online check in came from this address. My mobile boarding docs came from united.com though.